Gordie Howe boasts of enviable records in hockey both locally and internationally. He was famously known as ‘Mr. Hockey’ among hockey enthusiasts. Standing at 6 ft 0 in and weighing 205lb, Howe is considered the most complete Canadian player to have ever graced the game. Howe played for 26 seasons, from 1946-1980, in the National Hockey League (NHL). He also played for six seasons in the World Hockey Association (WHA). He broke and set various scoring records in his career. Most notably, Howe appeared among the top 10 scorers in NHL for 21 consecutive years. The 23-time NHL All Star has 801 career goals to his name. In 1953, the legendary player garnered 95 points, the then NHL record in a season. He’s remembered for Gordie Howe hat-trick where he scored a goal, gave an assist, and made a fight in the same game. Howe retired in 1971 and was inducted into the Hockey and the Saskatchewan Sports Hall of Fame. Two years into retirement, the legend made a turn around and rejoined the game to play with his sons, Mark and Marky, for the Houston Aeros. He briefly rejoined the NHL in the 1979-1980 season, becoming the oldest NHL player at 52 years and 11 days. 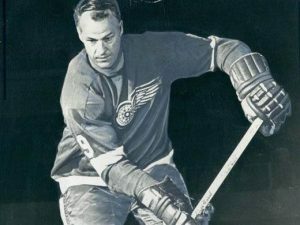 Gordie spent most of his career at Detroit Red Wings, playing for over 25 seasons. As mentioned in the above section, Howe also played for Houston Aeros. Other teams Howe played for include Omaha Knights, New England Whalers, Hartford Whalers, and Detroit Vipers. Howe won the Hart Memorial Trophy six times, the same number of times he won the Art Ross Trophy. In addition, the player who revolutionized hockey in North America won the Stanley Cup for years and was crowned the Goal scoring leader in 1951, 1952, 1953, 1957, and 1963. Howe received the Avco World Trophy in 1974 and 1975 and the Gary L. Davidson Award in 1974.